I love Languedoc wines! Of course, the region doesn’t have the reputation of Burgundy or Bordeaux, but this just means it can be a great source of quality wine values. This region in southern France, properly called Languedoc-Roussillon, has a wide range of interesting grape varietals and produces good white, red and rosé wine. I had a chance to host a #LanguedocDay party last year, deepening my appreciation for the region. For that event, I picked up a detailed map with the 30 Languedoc AOCs, available here as a pdf file. With my appreciation for wine from Languedoc-Roussillon, I was eager to jump into today’s French #Winophiles event focused on the region. As is typically my approach, I came up with a dish inspired by some of the region’s ingredients and recipes to come up with my own creation, rather than following a traditional recipe. I noted wild mushrooms were popular in the Languedoc cuisine, as is fresh seafood. I love mushrooms and salmon, so today served up Pan Seared Salmon with Shiitake Mushroom Sauce. This makes a simple yet elegant meal. First I make the mushroom sauce. In a nod to French cooking, I the shiitake mushrooms cook in a bit of red wine and get finished with butter. I’ll often serve sautéed mushrooms with meat or fish without the addition of butter, but hey, this is a French focused blog event! When the mushroom sauce is almost ready, I quickly pan sear the salmon following a method I adapted from Chef Barbara Lynch’s Stir (one of my favorite cookbooks!). 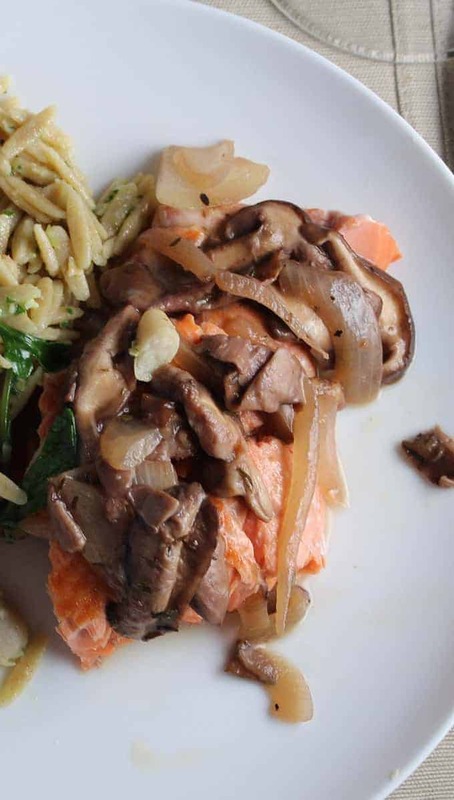 Plate the salmon, top with some mushroom sauce, and you’ve got a tasty and healthy dish! I served the salmon with a side of Orzo with Parsley Pesto, White Beans & Olives. Granted, this is probably more Italian than French, but I did read olives are common in Languedoc cooking. Wine Pairing: For today’s event, I had the meal planned first, knowing in the back of my mind I’d previously had some good lighter style red wines from the Languedoc that I thought would pair nicely with the dish. It so happened that when I went to Pairings Wine & Food to pick up the wine for this meal, the 2009 Clos Centeilles Minervois C de Centeilles Rouge ($20, 14% alcohol) was among the wines in the lineup to be sampled that evening. A taste reminded me that I’d enjoyed this one a few times before, and I grabbed it to serve with our meal. Minervois is one of the larger AOCs in the Languedoc-Roussillon, located toward the western end of the region. The Clos Centeilles wine estate is located at the foot of Montagne Noire, where the rivers Herault and Aude converge. I get violets on the nose of the C de Centeilles Rouge. I taste cherry and a bit of chocolate, and it has a silky smooth mouthfeel with great finish. 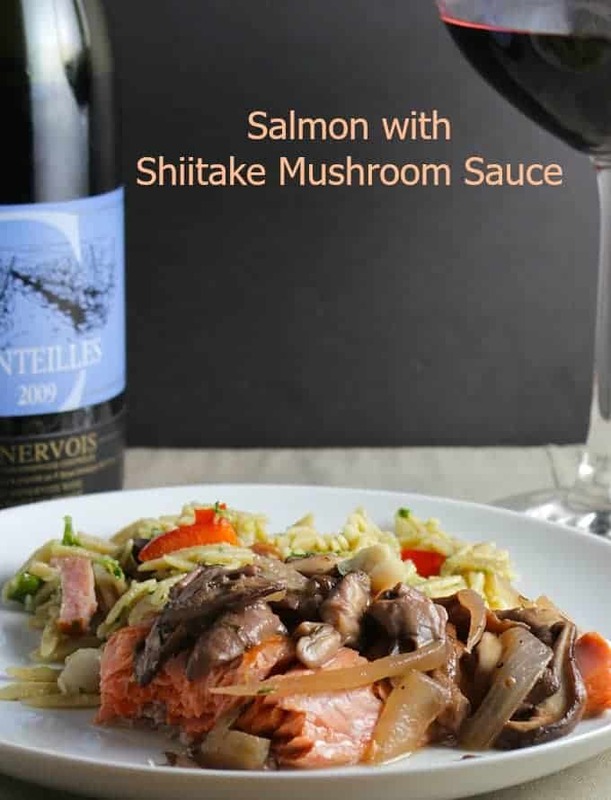 There’s a bit of earthiness here that picks up the mushrooms in the sauce; and the weight of this red wine is just right for the salmon with shiitake mushroom sauce. I give this wine and the pairing a definite thumbs up! 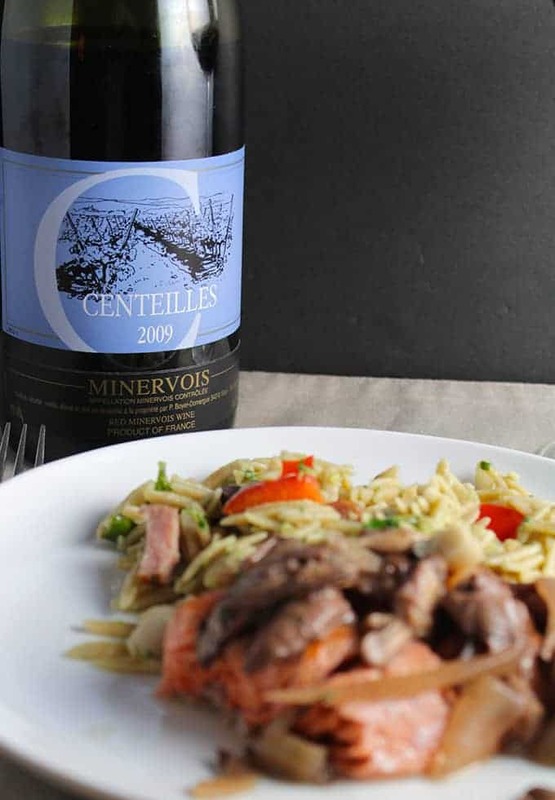 Try this C de Centeille Rouge with other food you might serve with Pinot Noir, and you should have a happy match. But this is no Pinot Noir, it’s made from an interesting blend of Picpoul Noir and Riveirenc Noir, grapes I suspect you are not likely to find much outside the Languedoc. Pan seared salmon topped with a savory mushroom sauce for a simple yet elegant main course. Make the mushroom sauce. Heat the olive oil in a skillet on medium heat. Add the onions, cook for about 5 minutes until they begin to soften. 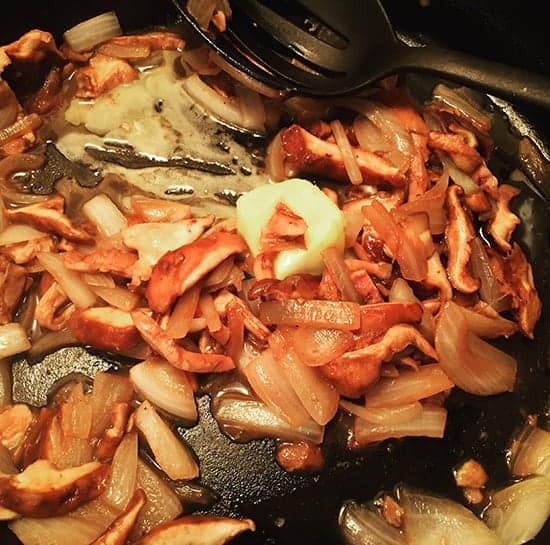 Add the mushrooms to the pan, and stir to combine with the onions. Add a pinch of salt. Cook until the mushrooms begin to “sweat” (give off liquid), then stir in the red wine along with the thyme. Cook the mushrooms until the red wine is mostly absorbed, about 5 more minutes. The mushrooms should be nice and tender now. Finish the sauce by adding the butter, stirring so it gradually melts in with the mushrooms. Add salt and pepper to taste. Cover and keep on very low heat to keep warm while you cook the salmon. Start cooking the salmon by heating the canola oil in a skillet on medium-high. When the pan is good and hot, add the salmon, skin side down. Sprinkle a little extra oil on top along w a touch of salt. Don’t touch the fish for about 4 minutes. After searing the salmon on the skin side for 4 minutes, flip the fish with a spatula. Cook on the flesh side for another 2 to 3 minutes. Remove salmon from heat and let it rest for a few minutes covered loosely with foil. The fish should still be very moist and have a dark orange color inside. Cut a portion of salmon for each person, and served topped with some mushroom sauce. Enjoy with a glass of red wine! Check out the rest of the Winophile Languedoc-Roussilon pairings! We will have a live Twitter Chat on Saturday 8am PCT/11 am EST, join us with #winophiles. October 17th we tour Cote due Rhone, we’d love to have you join us! Your salmon looks great, and I love that you chose Shiitake mushrooms, my fave! The Minervois looks good, especially with those lesser known grapes. I’ll need to search it out. I am always on the lookout for new salmon recipes and this not only sounds delicious it looks stunning. 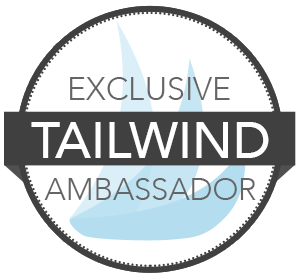 I had never heard of this wine region prior to this month’s event. How exciting for you to get to choose from a wine region you love. I’m with you on the salmon recipes, Wendy! A staple in our house so variety is nice. Your salmon looks delicious and I love the orzo salad too. A nice meal with a nice wine. Languedoc brings out the light side in all of us. LanguedocDay Party? That’s my kind of party! How fun. 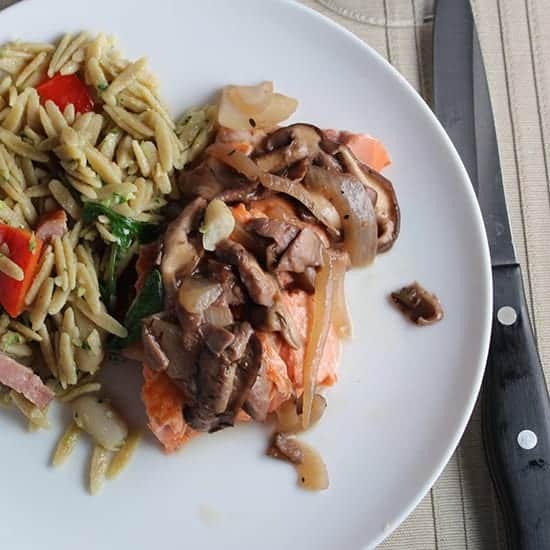 Your cooking always inspires me – this salmon with orzo looks and sounds fantastic. This looks ideal for bridging the summer and fall season. I’ll definitely be on the look out for the Minervois to try! Thanks Christy! It was a nice combo. And yes, the Languedoc party was fun! Need to repeat that next time. Little tardy in my visits to The French Winophiles this month. I had a crazy, busy weekend. But this looks delicious, David! Can’t wait to try i. And the wine…looks fabulous, too.